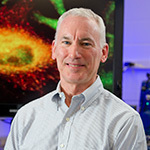 Paul Huber, Professor of Chemistry & Biochemistry and affiliated member of the Center for Stem Cells and Regenerative Medicine, has been selected as a recipient of the 2018 Rev. Edmund P. Joyce C.S.C. Award for Excellence in Undergraduate Teaching. Professor Huber joins 19 other faculty members as this year’s winners. Other recipients include Patricia Clark (Biochemistry), Brian Krostenko (Classics), A. James McAdams (political science), Michael Pries (economics), John Sitter (English), Anre Venter (psychology), Patrick Vivirito (Romance languages), Todd Walatka (theology), Lijuan Wang (psychology), Henry Weinfield (liberal studies), Margaret Forster (finance), Stephannie Larocque (accountancy), Elizabeth Moore (marketing), Jennifer Wadell (IT analytics), William Phillip (chemical & biomolecular engineering), Brian Smith (civil & environmental engineering), Ashley Thrall (civil & environmental engineering), Mark Olsen (biological sciences), and Kevin Vaughan (biological sciences). Adapted from an originally published article by Rebecca Hicks at chemistry.nd.edu on May 11, 2018.